Are You Ready To Be Junk Free in Durham? Junk Doctors is Ready To Make It Happen. If you’ve been looking for a solution to your junk problem, look no further. Junk Doctors is here to help! 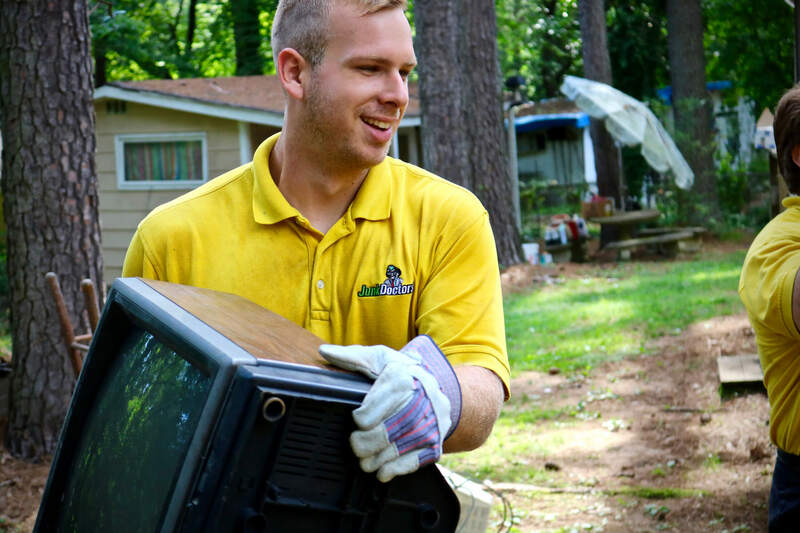 Our team is ready for whatever junk you throw our way by offering junk removal in Durham, NC. Purge your home of any items you no longer need to free up space and live more comfortably. We can even do full property clean outs and demolitions. The doctors do it all! Call 919-466-9322! Check out what happens when you bring in Junk Doctors to clean out your stuff! Give us a call or book an appointment online. We schedule in two hour arrival windows. We will call you when we are about 30 minutes out to let you know we are on the way. When we arrive we will ask you to show us everything that you want removed. That way, we can examine your junk and give you a firm estimate on the price of your removal. If you give us the thumbs up we will remove your junk right then and there. We will then head out to recycle, donate, or dispose of your items. There are some items we are not allowed to take because of the law. The types of things that we don’t take are concerns that you’d normally regard as hazardous – batteries, oil, old paint, paint thinners, antifreeze, propane tanks, solvents, pesticides and insecticides, fertilizers, pool chemicals and similar. Learn more about what we take. Durham County has provided residents with a Household Hazardous Waste facility that is located at 2115 East Club Blvd., Durham, NC. Residents can dispose of items here free of charge. Whenever you select a Junk Removal Company in Durham, NC you are choosing more than a trash pickup. Trash hauling is all about quality and reputation. At JunkDrs, to us, the two go together. Since our doors first opened we have always made it a priority to make sure that our reputation is strengthened each time we do a job for a customer. Courteous, on-time, thorough, and flexible are things that we pride ourselves on. There is no doubt that junk hauling companies are in business because they are a convenience service. Most people would be able to do the service themselves. However, they have decided that their time is not worth trying to do it themselves; not to mention the possibly of hurting themselves. From loading to driving and disposing of your unwanted items, you won’t need to lift a finger. Our team will go anywhere throughout your property to remove your items. You’re just a phone call away from a junk-free Durham house with JunkDrs! 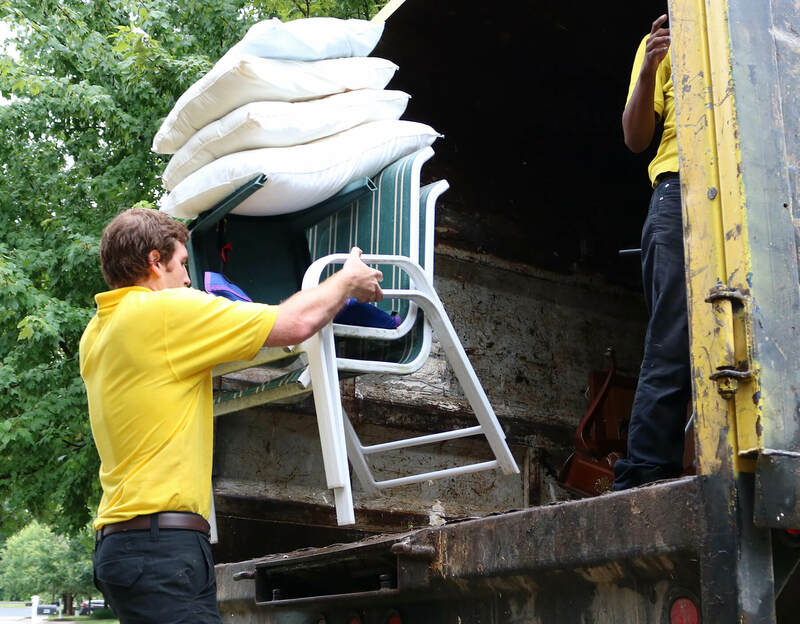 Call us for other areas too – like removing junk in Chapel Hill. What happens to all the stuff you are hauling? Junk Doctors does our best to recycle and donate as much as possible. This serves a few purposed for us. The most important is the fact that it is the right thing to do. It is great for the environment and great for the local community. The other reason is the fact it actually saves us money. We pay disposal fees for all items that are dropped off at a landfill. The more items we can recycle and donate the less we pay in disposal fees. If you have large furniture our team believes can be donated we will take it there on your behalf. If you have items that are smaller you would like to have donated you will need to box those up beforehand and label them “donate”. Hiring Junk Removal Experts vs Renting a Dumpster: Which Is Better For You? Unless you have a truck or want to rent one to do a cleanup project yourself you are basically left with two options: hiring a junk cleanup and removal service or having a dumpster delivered. Each choice has got its advantages. If you have a general household or business clean up project, then hiring a rubbish removal service is likely the route you would want to take. A good junk hauling service will bring a truck and a team to your location to do the work for you. You simply would show the team what needs to be removed and they would take over from there. In the case of Junk Doctors, we will go all throughout your property to load your items at no additional cost. You are simply charged a rate dependent upon how much space your items take up in our truck. Having a Furniture, general trash, moving boxes, washers, dryers, televisions, electronics, and the like then a Durham, NC Junk Remover service is probably the way to go. This is the fastest and easiest way to get rid of junk. Should you be doing a home renovation project you might lean towards dumpster rental. The nice thing about renting a dumpster when doing a home improvement project is the fact you can have the dumpster delivered and simply fill the dumpster as you go. Often times these projects can take several weeks, especially if you are doing it yourself. When you are finished with the dumpster you would simply dial up the company and they would come pick the dumpster up. A lot of times that is your best option in that scenario. Sometimes with construction debris removal, it is still best to go with trash removal services. This is normally the case when you simply do not have room for a dumpster. When using a Durham Junk Removal company for your construction debris removal you are able to stack the items wherever you would like. You would then send the team in there to pick them up and haul them off for you. The other time renting a dumpster might make good sense is when you need some extra time to go through the items. For example, if you are clearing out an estate. You often need to look through everything that is going to sort what should be sold, destroyed disposed of, kept for sentimental reasons, etc. You might also value privacy at this time. In those cases, dumpster rental could make good sense. Junk Doctors can also help you sort through those items though. It would be done by using both our Labor services as well as our junk removal services. This will allow you the opportunity to look through the items without having to do the labor yourself. This allows you to sort through the stuff but save some time in the process. Junk Doctors is here to help rather you decide to use our service, do the job yourself, or rent a dumpster. If case you have any questions about Rubbish Removal in North Carolina then feel free to give us a call. We are more than willing to help. Interested in Commercial Junk Removal Durham, NC Services?